Since nobody has posted in this forum I thought I might kick start the thread. 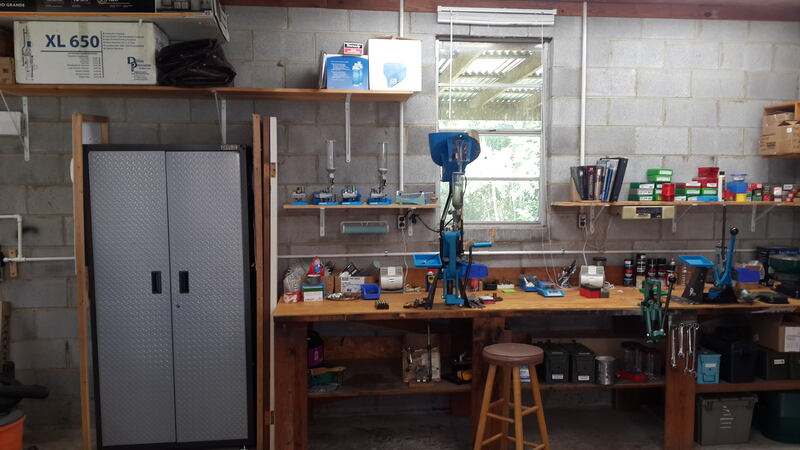 Here are a few pictures of my loading rooms. Yes I am partial to Dillon for my handgun loads, but I like my RCBS Rock Chucker for precision rifle loading. 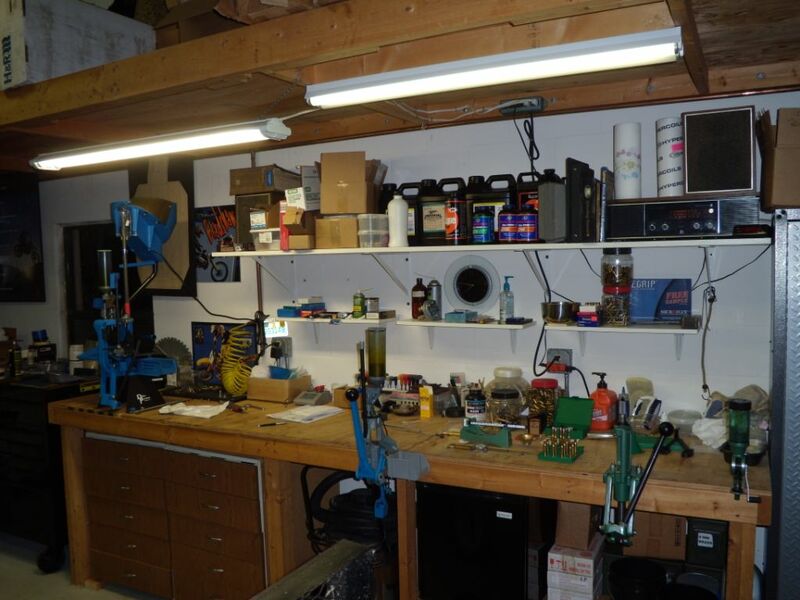 The metal cabinet on the left is for storing my clean brass and powders. 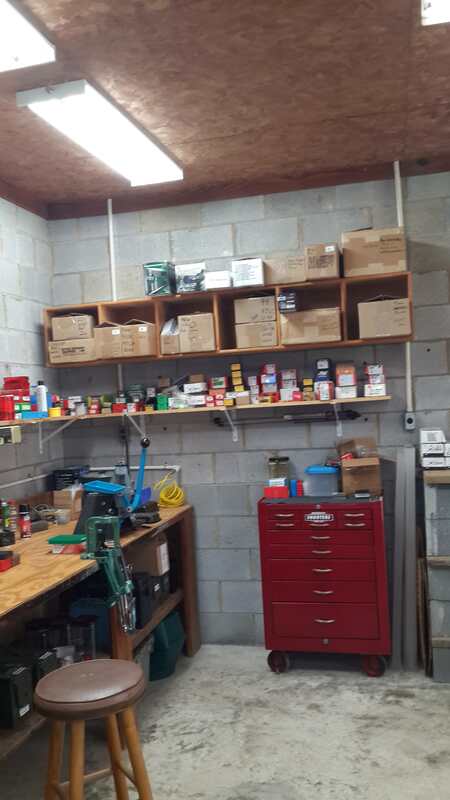 The shelving on the right, over the red tool box is for storing projectiles. Very nice, though I am not too sure about using regular pvc piping to run electrical wiring through. Seems that I recall if you get a melt down it will put off some serious toxic gas. Very nice! I see Hogdon Universal on your shelf. Do happen to use that with 9mm? If so, do you load it with 124 gr jacketed? It used to be my favorite powder and just got some more recently. I still have some Universal but haven't used it in quite some time for 9mm. My pet load for 9mm is now 147 gr Precision Bullets over 3.3 grains of HP38 for soft shooting target rounds. For higher powered jacketed stuff I like to use HS-6. Ok thanks! I have some HP 38 as well. I just ordered some Precision Delta bullets for the first time last month, and was pretty impressed with the prices-quality. They are swaged lead core with a dry lube coating. You load them like lead bullets and they run real clean with no lead fouling or copper buildup. A little bore cleaner and a couple patches run through the barrel and it is clean as can be.